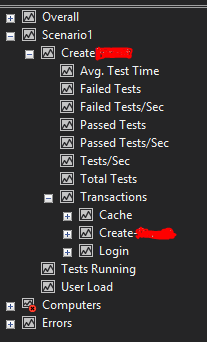 Can I create a custom TestContext timer for UnitTest/LoadTest in Visual Studio? A few of my UnitTests have a Sleep that is defined in a loop. I want to profile not only each iteration of the test, but the overall time for all iterations, in order to show any non linear scaling. For example, if I profile the "Overall", it includes the time for the sleep. I can use Stopwatch Start/Stop so that it only includes the doAction(). However, I can't write the Stopwatch results to the TestContext results. It seems that TestContext can be inherited from and redefined. However, I do not see any examples for how to write this back to the transaction store. Is there an implementation for this I can refer to, or another idea. I would like to see it in the same report that Visual Studio presents for the LoadTest. Otherwise I have to write my own reporting. Also, I have tried sniffing the SQL that writes these to the LoadTest database, but was not successful in figuring out how. There should be a SPROC to call but I am thinking it is all of the data at the end of the test. Well, I had a similar problem. I wanted to report some extra data/reports/counters from my tests in the final test result like Visual Studio does and I found a solution. First, this cannot be done with the way you are trying. 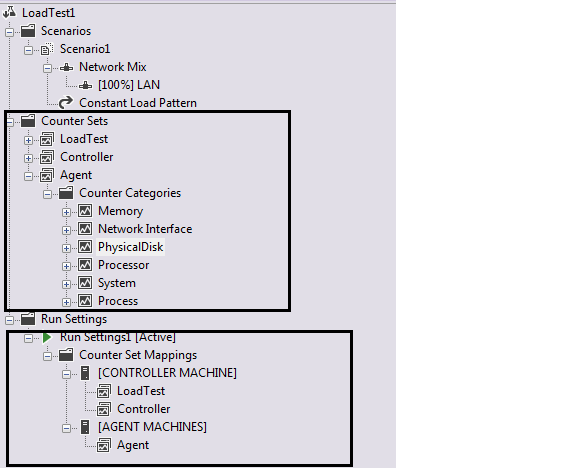 There is no direct link between the Load Test and the Unit Test where the TestContext exists. Second, you have to understand how visual studio creates the reports. It collects data from the performance counters of the OS. You can edit these counters, remove those you don't want and add others you want. The Counter Sets. These are sets of counters, for example agent which is added by default. If you open this counter set you will see that it collects counters such as Memory, Processor, PhysicalDisk e.t.c. So, at the end of the test you can see all these data from all your agents. If you you want to add more counters to this counter set you can double click on it (from the load test editor, see picture below) and select Add Counters. This will open a window with all the counters of your system and select those you want. The Counter Set Mappings. Here you associate the counters sets with your machines. By default the [CONTROLLER MACHINE] and [AGENT MACHINES] are added with some default counter sets. This means that all the counters contained in the counter sets which are mapped to the [CONTROLLER MACHINE] will be gathered from your controller machine. The same applies for all your agents. As you can see, I have added an extra machine with name db_1. This is the computer name of the machine and it must be at the same domain with the controller in order to have access to it and collect counters. 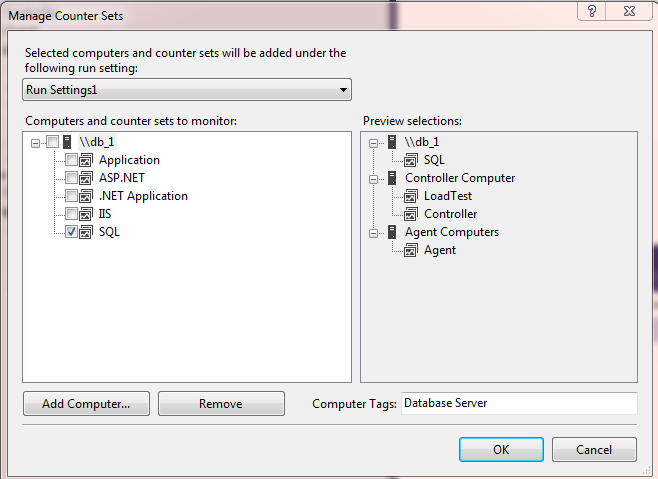 I have also tagged it as database server and selected the sql counter set (default for sql counters but you can edit it and add any counter you want). Now every time this load test is executed, the controller will go to a machine with computer name db_1 and collect data which will be reported at the final test results. Ok, after this (big) introduction it's time to see how to add your data into the final test results. In order to do this you must create your own custom performance counters. This means that a new Performance Counter Category must be created in the machines you need to collect these data. In your case, in all of your agents because this is where the UnitTests are executed. After you have created the counters in the agents, you can edit the Agents counter set as shown above and select your extra custom counters. Here is a sample code on how to do this. Now, when your tests are executed, they will report to the counter their data. At the end of the load test you will be able to see the counter in every agent machine and add it to the graphs. It will be reported with MIN, MAX and AVG values. I think (after months of research) that this is the only way to add custom data from your tests to the final load test report. It may seems too hard to do it. Well, If you understand the point it's not difficult to optimize it. I have wrap this functionality in a class to be easier to initialize, update and after all to manage the counters. It is very very useful. I can now see statistics from my tests that it would not be possible with the default counters. Such us, when a web request to a web service fails, I can catch the error and update the appropriate counter (e.g. Timeout, ServiceUnavailable, RequestRejected...). Update. I believe what is asked in the question cannot be provided with the APIs available directly within Visual Studio's load test environment. Data and Diagnostics Adapters can be written for Web Performance tests and probably also for unit tests. By using such an adapter code can record data from an application or test suite and have it recorded within the test results. There are several Microsoft blogs and MSDN pages about writing Data And Diagnostic Adapters. The easiest way is the OP's original approach, there just seem to be some gotchas that I ran into and others seem to as well. One is that for some reason TestContext.BeginTimer(string); does not always exist, see this for evidence, but seemingly no solution. But there is another issue of incorrectly creating and using the property. If you do not have a property to store TestContext and try to use TestContext.BeginTimer(); you will get a message "Cannot Access Non-Static Method 'BeginTimer' in a static context". The reason some people do this is because most examples have the TestContext property as `TestContext TestContext;' See 3 for the reason the examples use this. If you assign your TestContext property in say ClassInitialize or AssemblyInitialize you seem to get something that is not quite right, you get one instance of the test context, which in the past I have had no problem with for unit tests and Coded UI Tests, but load tests do not handle this. What you will see if you do this is an error "There is already an active timer with the name 'TimerName' passed to BeginTimer". So the end solution, make sure to setup your TestContext as a full property, if you do this the property will be set by the test execution engine independently for each load test run. This means you do not have to set the value yourself. All of which can then be viewed on the graph. 50 values for "Per" of 0 second each. Which I think is the intended result. These issues took me a few hours to figure out and after some testing to exactly pinpoint and verify, but in the end this seems to be the easiest and best solution. On a side note this is the correct implementation of TestContext to make Data Driven Testing work properly as each test can get its correct data from the context. Not the answer you're looking for? Browse other questions tagged c# visual-studio unit-testing load-testing test-framework or ask your own question.